The early Roman Catholic inhabitants of the Mount Pearl, Topsail Road area belonging either to the Corpus Christi Parish, Kilbride or St. Thomas of Villanova Parish, Topsail, for the borders of both these parishes met in the area. Prior to 1956, there was neither Roman Catholic school nor Chapel, and the Roman Catholic people of the area had to go either to St. John's, Kilbride or Topsail, to attend to their religious duties. On June 10, 1956, His Grace, Archbishop P.J. Skinner, the former Archbishop of St. John's, made an announcement that was to place the people of this area under the jurisdiction of the Basilica Parish, but it really marked the first beginning of Mary Queen of the World Peace Parish. In a letter dated Jun 10, 1956, his Grace wrote that there would be construction of a new school-chapel on the south side of Topsail Road, a short distance east of the junction of Topsail and Blackmarsh Road. This school-chapel would look after the needs of the families and children in Mount Pearl, Glendale and Topsail Road area. The school-chapel was completed in the late fall of 1956 and the doors opened right after Christmas vacation. Priests from the Basilica came each Sunday, and the people oiduae area could now fulfill their religious obligations in their own community. In 1962 a full time priest (Rev. John B. Kent) was assigned to the parish and prior to this assignment, Father Kent was Pastor of the Foxtrap, and it is said that the Foxtrap Parish loss was the Mary Queen of the World's gain. With the aid of free labor from the parents of the parish, many projects were taken on and completed such as a school cafeteria, a rectory, a house for the Sisters as well as many extensions to the school and church. Father Kent was with the Parish for 4 year and died while celebrating mass on Aug 03, 1969 of a massive heart attack. 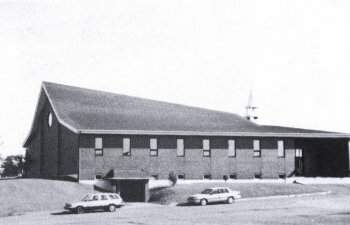 In 1983, construction was started on the new and existing church that would replace the Chapel first opened in 1956. While this church is not an old one, it shows that the people who were members of the congregation, once belonged to Corpus Christi and St. Thomas of Villanova, where the older records for the people of that area can be found. The Church opened in 1956 and prior records can be found at the Basilica, St. Patrick's, Corpus Christi and St. Thomas of Villanova. There are no Vital Statistics Volumes (DPHW) existing for this Parish. The death records existing for the Mary Queen of the Peace Parish are from 1964 onwards.